"Clint & Clyde are back! And one of them thinks pooping in your car is hilarious! I'm not telling you who though." Updated on December 22, 2005, with some important (and somewhat sad) news. Despite all conventional thinking, Clint Eastwood and an ape named Clyde turned out to be movie magic in 1978. The story of the fist fighting man named Philo and his primate companion grabbed the national conscience and wouldn't let go until they begged for more. So what do you do when a sequel is the only answer? Well, YOU MAKE ONE! ANY WHICH WAY YOU CAN!!! I'm sorry, I'm sorry. . I couldn't help myself. 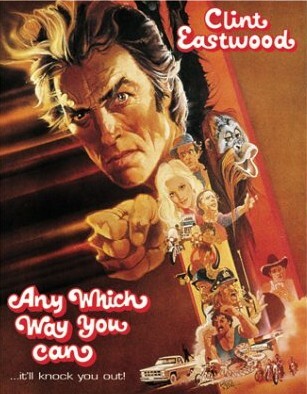 They did make a sequel to Every Which Way But Loose, and the message for how this one should go couldn't be simpler. They said, "I think the first one was a little too subtle. We could go broader with the humor. More Ape! More Brawlin'! Let's blow the doors off this sucker!" Normally I would say this is a recipe for disaster, but this is one of those rare cases where it worked. Philo has fallen back into his fist fighting ways after the last film, but he tells his promoter/friend Orville (Lewis) that retirement from the game is definitely on his mind. Clint actually scaled back his goofy demeanor from last time and manages to be even flintier (if that's a word) this time out. He was scorned by his country-singing girlfriend in the first film, played by Sondra Locke, and even a man as tough as Philo doesn't recover from that easily. Naturally Ms. Locke shows up again, asking for Philo's forgiveness and eventually receiving it. She continues to show off her exiguous singing talents, made even punier by the star power in this sequel (Glen Campbell, Fats Domino, and Jim Stafford all make an appearance; Clint even sings a duet with Ray Charles during the opening credit sequence entitled, "Beers To You"!) With a woman by his side, Philo seems even more content to give up the fighting life. But some mob-ish business types from the east coast think they can make some money matching up Philo with their own tough guy, Jack Wilson. Wilson is played by Tough Guy Emeritus William Smith, familiar from numerous roles in B-movies and a villainous staple for 6 decades now. How tough is Smith? According to his IMDb biography, he's a 2-time arm wrestling champ, played semi-pro football, got into the Guinness Book of Records for reverse curling his body weight, was 31-1 as an amateur boxer, worked as a stuntman and stunt moto-cross rider, and was awarded the purple heart during the Korean War. Hell, he played The Marlboro Man in the last televised Marlboro commercial! Flintier indeed! At any rate, the mobsters are able to convince Philo to fight, which brings every high-roller in the country out to bet on what is sure to be the bare knuckle brawl of the century (which I'll get to later). While the finale is the highpoint, there were other aspects that make this more enjoyable than the original. Two of the low points from the first film, Orville's Ma (played by Ruth Gordon) and the 'Black Widow' biker gang, are improved upon this time out. Ma isn't just 'foul-mouthed' but 'horny and foul-mouthed' in this effort, and who doesn't find a libidinous senior citizen hilarious? 'Cocoon' made a mint, so I'm obviously not alone here. And while the biker gang's swastikas are still evident, their slapstick is more effective. The fact that during their hi-jinks they all end up completely hairless and spring for women's wigs by the end definitely made me laugh. But in the end, it's all about Clint and Clyde. Clint, as I said earlier, plays it a little closer to the vest this time, but he's entertaining nonetheless. And he's got a fellow tough guy in Smith to bump up against this go around. The development of their respectful relationship is fun to watch, and nothing beats seeing these 2 clear out an entire bar during a brawl. It's about as macho as you can get before drifting into latent homosexuality, which I'm guessing wasn't their target demographic (or maybe it was! The Village People's "Can't Stop The Music" came out in 1980, so I'll let you decide!). Monkey-lovers, however, could rejoice, as Clyde got a lot more screen time as well as his own theme song this time out ("Orangutang Hall Of Fame" Sung by Cliff Crofford). I wonder if permit applications for pet orangutans went up in the late 70's-early 80's? I would have traded in my pet rock for Clyde anytime. "3-D" boom of the early 80's, but didn't get the same treatment as the "Jaws" and "Friday the 13th" sequels did). The "Big Fight Finale" ratchets up the camp-factor and has the 2 combatants ranging all over the town of Jackson Hole, Wyoming, blasting through walls and leaving a trail of destruction as they go. The on-screen audience moves with the fighters throughout the landscape and it's truly hilarious, as well as exciting. The truthful consequences of a 15-minute, bare-knuckle brawl are deliberatelly underplayed (Philo actually breaks his arm at one point and keeps on fighting! ), but Clint and William Smith are nearly tough enough to suspend your disbelief. When they show up at the end with relatively minor injuries, you just have to chalk it up to them being unbelievably tough guys. This movie was a spectacular kick-off to the 80's! 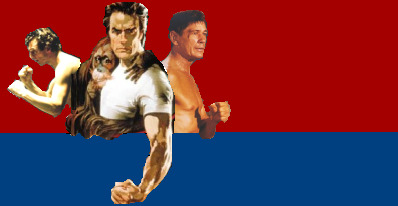 I have fond memories of this, and not just because of my love for the twin-genres of "Fighting" and "Monkey" movies. They just don't make movies like this anymore. When's the last time that you saw a mixture of iconic action hero-types blended successfully with goofball comedy. The tough guys of today are either unwilling or unable to give it a go. The most recent semi-successful attempt at it that I saw was in 2003's "The Rundown", starring Dwayne "The Rock" Johnson and Seann William Scott of "Stifler" fame. But that effort pales in comparison to the kind of rock'em, sock'em fun that "Any Which Way You Can" offers. "The Rundown" did have monkeys though, and that, I submit, was a step in the right direction. I received a complimentary e-mail from artist AND fellow great ape enthusiast Bob Cooper regarding this review and the other Clint Eastwood/Clyde classic Every Which Way But Loose. Unfortunately Bob had some sad news about the fate of the orangutan who played Clyde in this film. Apparently one of his handlers got overzealous after the filming and beat the poor animal to death. Please click this link to see Bob's Tribute to Clyde, and for further information about abuse of apes in the entertainment industry and what you can do to help end the abuse, visit The Chimpanzee Collaboratory. Thanks Bob!